I started out on Google at 3:00 pm today for some information on emulsions, and at 3:20 pm I was looking at this. I felt vaguely strange. 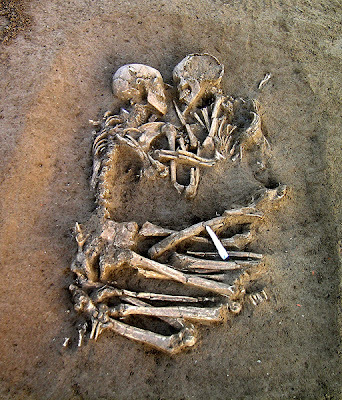 Archaeologists have unearthed two skeletons from the Neolithic period (5000-6000 years ago) locked in an “eternal embrace” and buried outside Mantua, Italy, about 25 miles south of Verona. Sounds familiar? It’s the same city where Shakespeare set the tale of Romeo and Juliet. Here’s the bigger catch – In Romeo and Juliet, Romeo is sent to Mantua for killing Capulet in a sword fight. Romeo then leaves the city and returns to Verona when he hears that Juliet has died. It was found at the site where a factory is planned and many have speculated on the circumstances this goosebumps-giving spectacle. Flint tools, including arrowheads and a knife, were also found alongside the couple. Their teeth being intact, it is thought that the couple died young. They are face to face and their arms and legs are entwined and they are really hugging. When I was reading through the user comments on the related news pieces, almost everybody had the same thing to say – of not to disturb them from their grave. Unfortunately, it has already been done. more like nosey parkers strike again! It’s chillingly disturbing. I love your blog for the simple reason that it brings me to notice SO, SO many different things all around. If you were awestruck at seeing the photo in your blog, then be prepared for oohs and OMGs! Thanks for the link, Nikhil! It sure is very captivating… so is ‘The Big Picture’. It sure takes away a LOT of productive time out of one’s schedule! Yeah these Green Sahara ones were terrific! The one with the finger in the mouth really disturbed me!! !